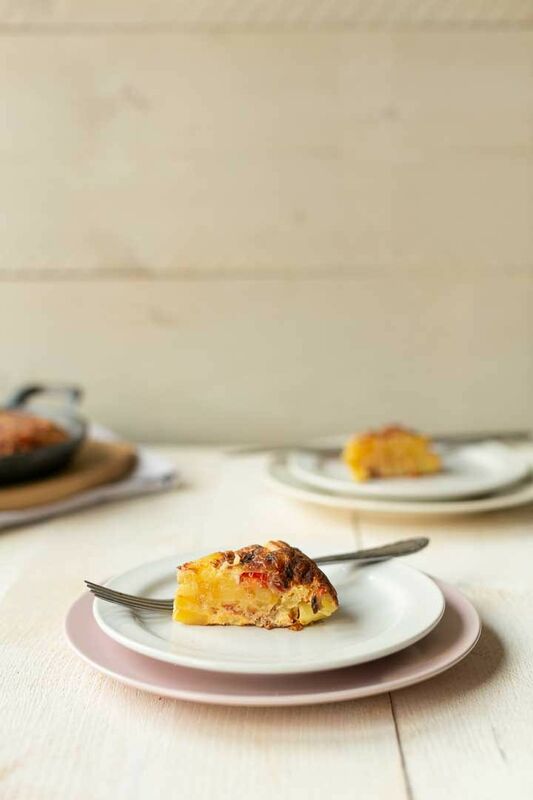 The best authentic Spanish tortilla recipe with Serrano ham is a great tapas or party dish. With all of the Christmas parties coming up this is ideal to serve or to take along as a gift. 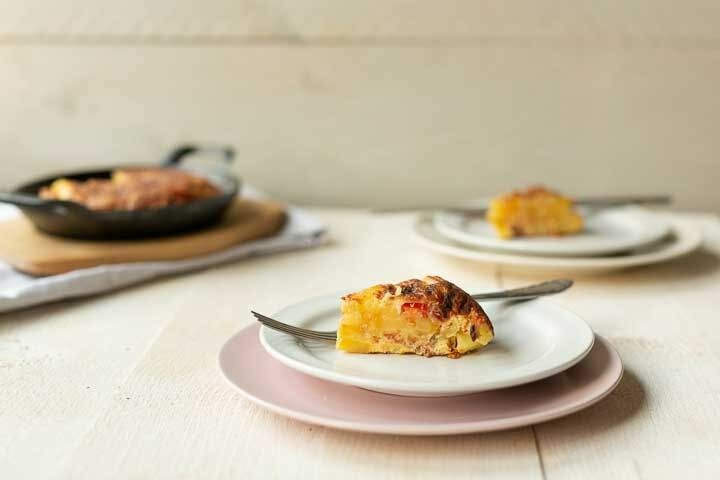 Want to know how you can make this authentic Spanish tortilla recipe with Serrano ham? Lets get started! 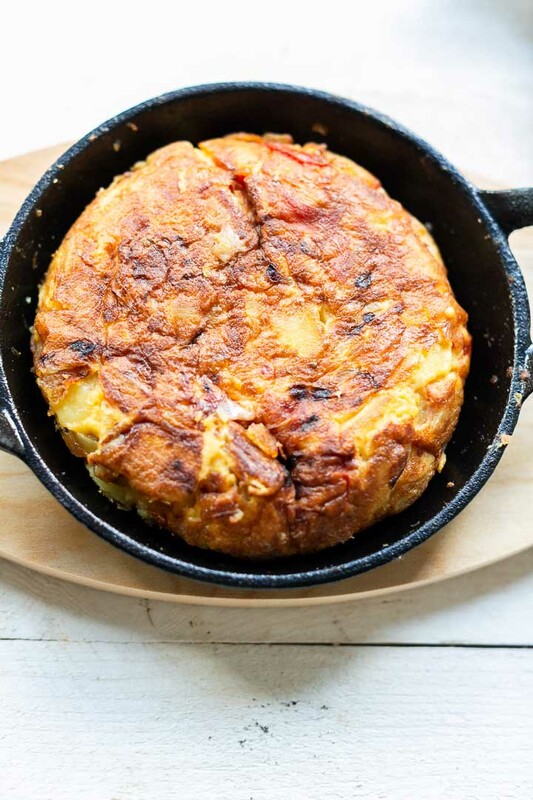 I love authentic Spanish tortilla and when I came across this cute cast iron skillet I knew what I was going to make. 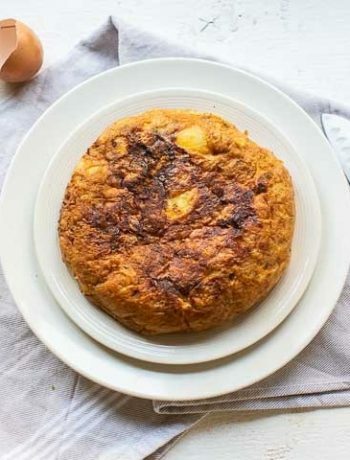 Yes authentic Spanish tortilla with Serrano ham. 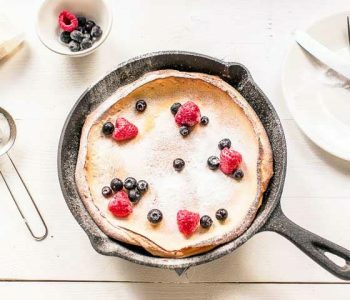 This mini cast iron skillet is really amazing. I found it online not knowing it would be this small. The moment I saw it I knew I would be making a Spanish tortilla in it. The trick is to not cook tortilla on high heat. The eggs in the recipe will be burned fast so if you lower the temperature to medium your eggs get time to set and the outside will get a beautiful brown color. 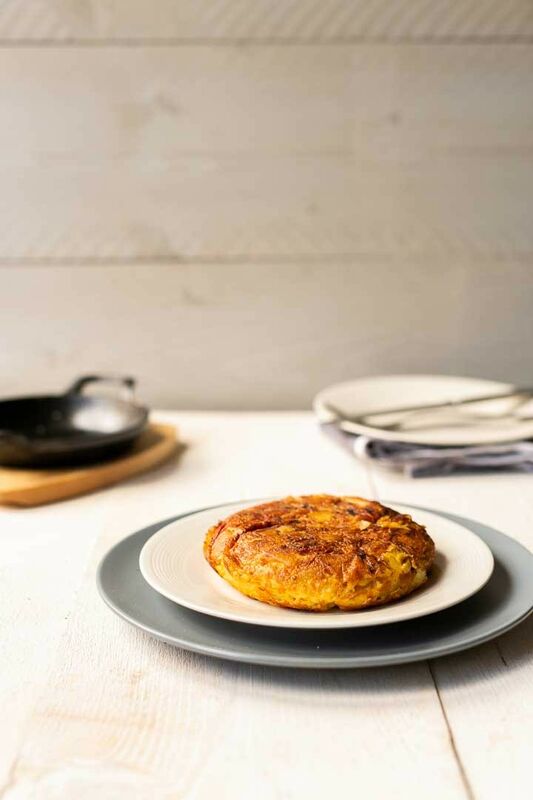 As the skillet is round you get that real Spanish tortilla shape. 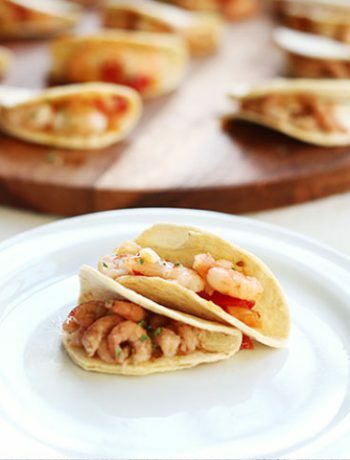 This recipe yields between 8-12 portions and is ideal to serve at a party. But I also like to make it as a lunch dish for two. This is a very easy recipe. Start with boiling the potatoes, onion and garlic for 20 minutes in olive oil on a low simmer. Be careful to not fry your potatoes so keep it on a low simmer just enough to let the potatoes boil. In the meanwhile whisk the 2 eggs. 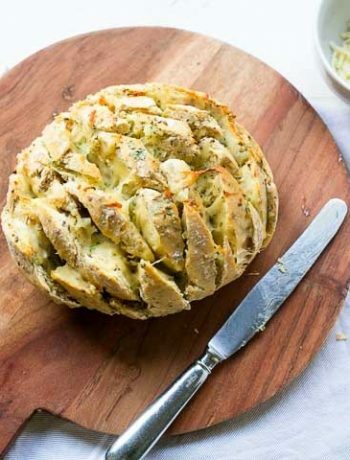 Drain the potato mixture and preserve the olive oil you can use it to cook other dishes with it. When the potato mixture is drained add the potato mixture to the whisked eggs and stir. Heat the skillet with some oil. Add the cherry tomatoes and the Serrano ham to the mixture and pour into the skillet. 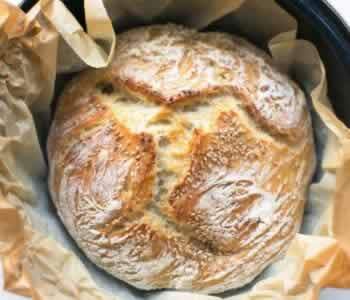 Bake for 4 minutes on medium heat to let the egg set. As cast iron skillets get really hot you do not need to heat it up real high. If there is one down side is that it is quite difficult to handle when you want to turn the tortilla. 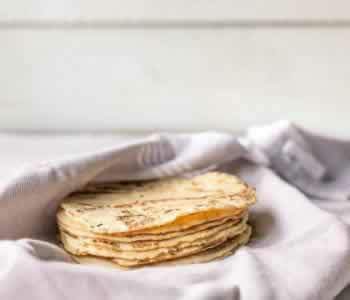 To turn a tortilla the easiest way is using a small plate. You put the tortilla on it. The next step is to over the plate with the cast iron skillet and turn the tortilla and bake the other side for 4 minutes. 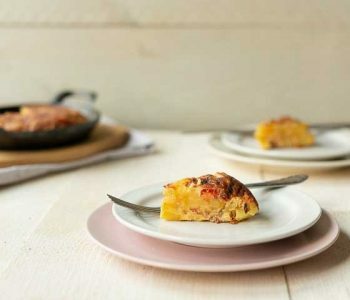 This skillet is so cute you can use it to serve this authentic Spanish tortilla recipe with Serrano ham party edition. I am sure you will get a lot of complements on just your mini skillet. 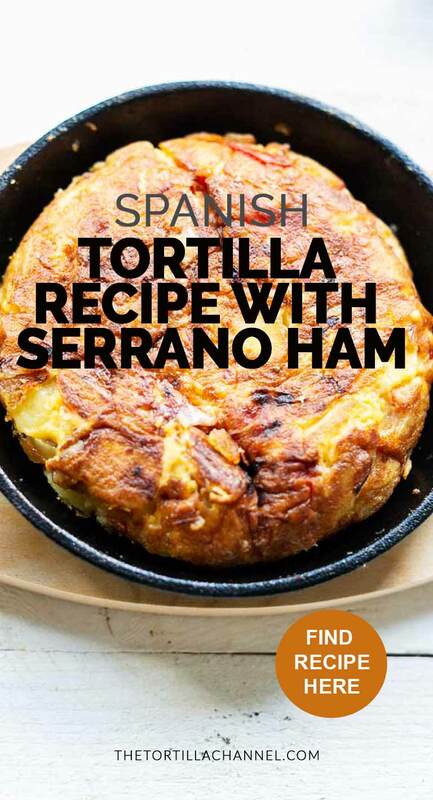 Have fun creating this authentic Spanish tortilla recipe with Serrano ham ! Made a recipe tag @thetortillachannel on Instagram or PIN on Pinterest. 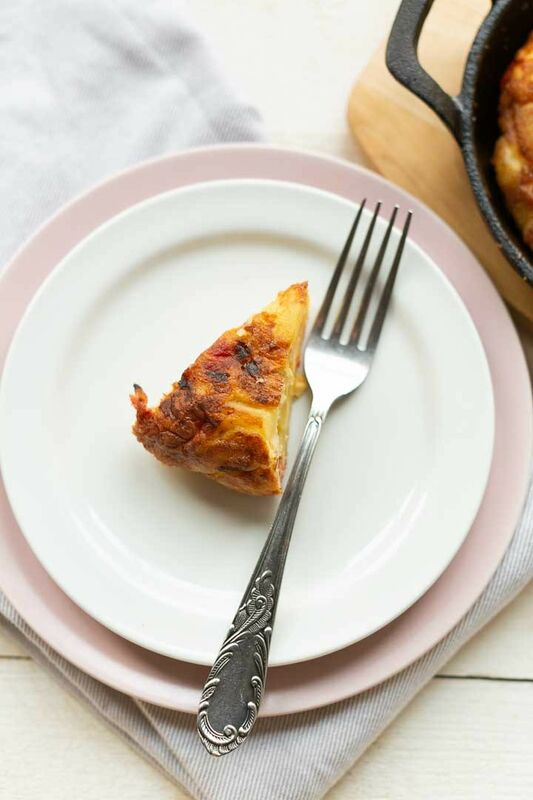 Want to know how you can make this authentic Spanish tortilla recipe with Serrano ham in a mini cast iron skillet? Lets get started!